This article explains the strategy for Indexing JSON value in Sql Server 2016 with examples, as we don’t have any special indexes like the XML indexes which we had for the XML value stored in the XML data type column. If we are storing JSON data in a table column, then we may come across a scenario where we may need to retrieve only the records with specific JSON property value. 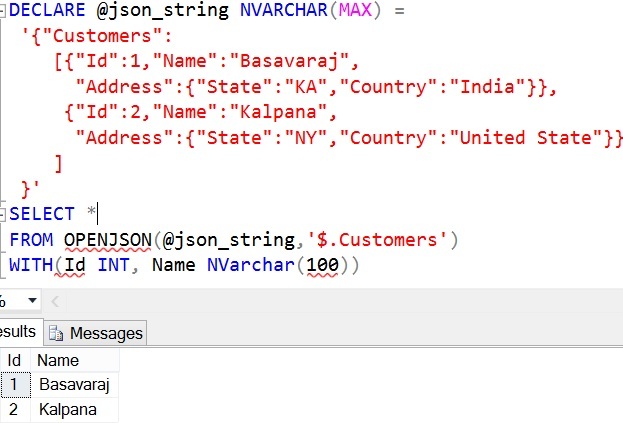 For example if we are storing Customer address and phone details in JSON structure in a Varchar/Nvarchar column, then we may get a request to get all the customers whose phone member matches to the input value. To handle such use cases, creating an index on the JSON column is not the correct approach and of no use. 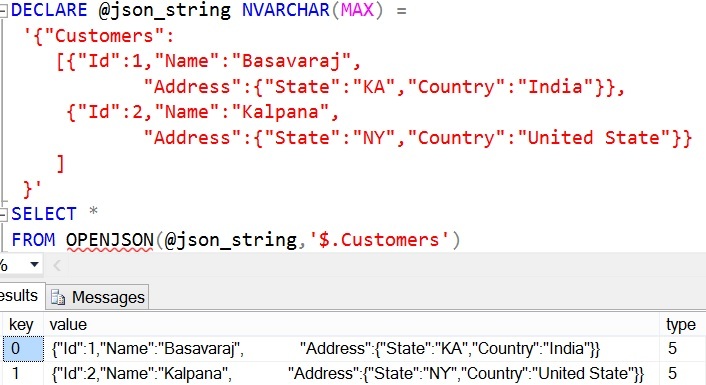 As it indexes the complete JSON value like any other value in a Varchar/NVarchar column and we are looking for particular JSON Property value which is not at the beginning of the JSON string. And also it takes lot of additional storage space as the complete JSON value is indexed. So, creating such indexes is of no use. But for JSON we do have an alternative way of Indexing JSON Property. This article explains how we can index a JSON property from the JSON string by example and also explains the storage implications if any. Below is the Customer table storage usage details at this point of time. From the above result it is clear that fetching the customer data with this approach is resulting in higher number of IO and CPU time. First add a non-persisted computed column PhoneNumber to the Customer table and the value of this computed column is the Phone property value extracted using the JSON_VALUE function from the Detail column having Address and Phone information stored in the JSON format. From the results it is clear that a non-persisted computed column doesn’t take any additional storage space. Non-persisted computed column value is computed/evaluated at run-time. Let us now try to get the details of the Customer whose phone number is 99890000 by using the computed column PhoneNumber. From the result it is clear that the computed column didn’t improve the IO and Time taken to execute the query. When you create this index you may get the below warning. 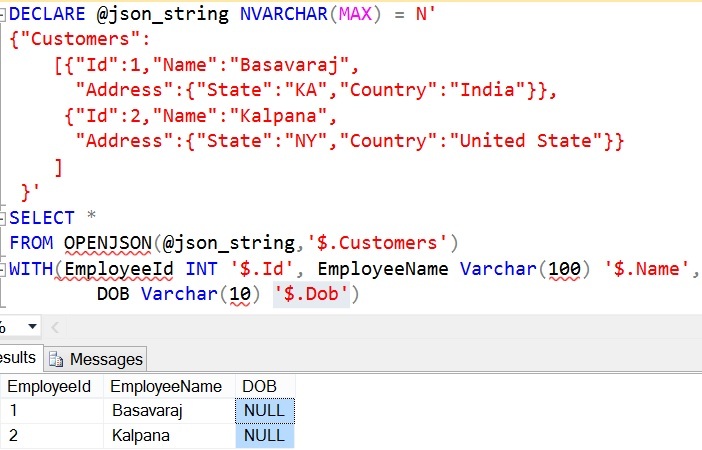 The reason for the warning is Sql Server doesn’t know what will be the length of the value which will be extracted by the JSON_VALUE function. 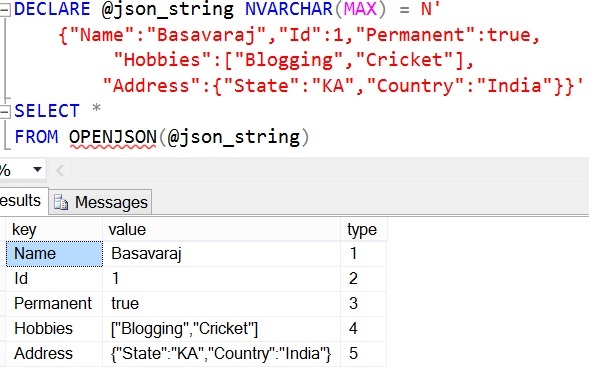 And the maximum length of the value that can be returned by JSON_VALUE function is NVARCHAR(4000). Warning! The maximum key length for a nonclustered index is 1700 bytes. The index ‘IX_Customer_PhoneNumber’ has maximum length of 8000 bytes. For some combination of large values, the insert/update operation will fail. From the result it is clear that there is no change the storage used for the table, it has taken only the extra storage for the index. So the computed column is still not persisted only in the index tree the computed value is persisted. Which is similar to creating index on any other table column. Now let us verify whether we have any improvement in the performance of the query to retrieve the Customer details based on the Phone JSON property value (i.e. by the indexed computed column PhoneNumber). From the result it is clear that adding index on the computed column has drastically improved the IO and CPU time. We can execute the below statement to disable the IO and TIME statistics, which we have enabled in the beginning of this article. Conclusion: If we have a need to retrieve record from table based on a particular property value in the JSON string column, in such scenario creating a computed column whose value is extracted by the JSON_VALUE function from the JSON string column and indexing is the optimal approach. It takes extra storage for the index just like indexing any other column. And the computed column is still not persisted even after creating an index on it. And while creating index it takes some extra time to evaluate and extract the computed value to store in the index pages, again this is noting different when create a index on a computed column. 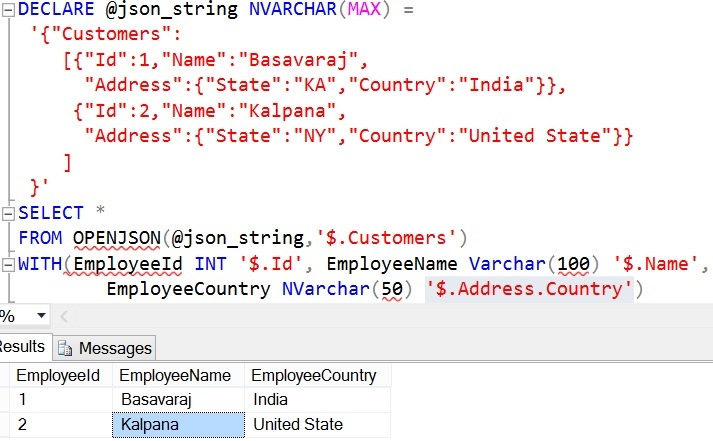 OPENJSON is one of the new JSON function introduced in Sql Server 2016, it is very much similar to the OPENXML function. This table valued function can be used to transform the JSON text to one or many rows. Basically, it provides a row-set view of the input JSON string. json_string is the JSON string from which will be transformed to row(s). 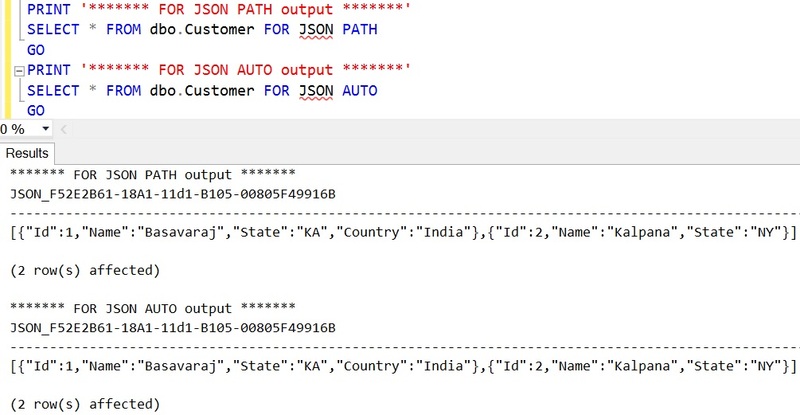 json_path is the location of the JSON string in the json_string parameter, which will converted to one or many rows. WITH clause: This is an optional clause it can used to explicitly specify the schema of the result. Each column in the resultant output can be defined by specifying the column name, column type, it’s location i.e. column json path and the [AS JSON] clause specifies that the column value will be a JSON object or an array, if it is not specified the expected column value is a scalar value. Let us understand this OPENJSON function with an extensive list of examples. From the result we can observe that when OPENJSON function is executed with the default schema (i.e. Without explicit schema declarartion), following three columns are returned in the result. type: An integer number that represents the type of the value. Next example explains all the possible type values. So from the result we can say that type clumn value will be 1 in case the value is STRING, 2 if the value is of type INT, 3 if the value is of type Boolean, 4 if value is of the type JSON array and 5 if the value is of the type JSON object. Example 6: Input JSON string is a JSON array of strings. Example 7: Input JSON string is a JSON array of integers. From the results of example 6 and 7, we can see that OPENJSON function converts the JSON array to a result set. So such feature will be useful in converting an array of input values to a temporary result and joining with other tables. Example 1: This is an example of an OPENJSON function with explicit schema declaration. In this example the json_path in the OPENJSON function points to the array of the JSON objects. 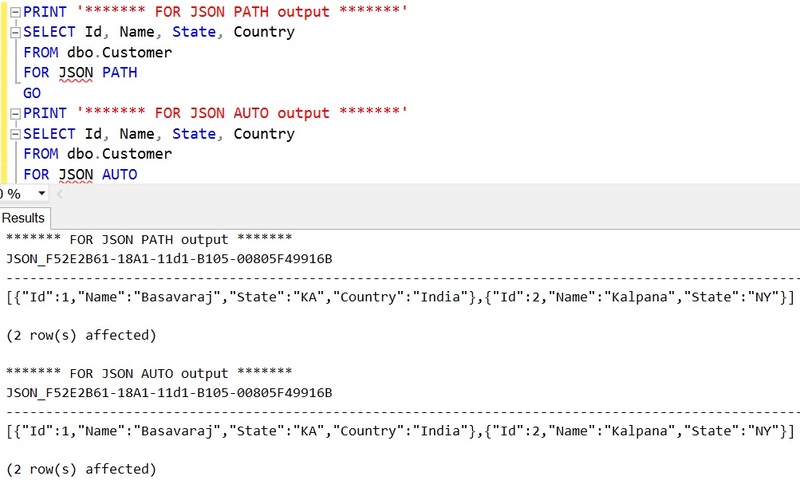 In the schema declaration columns values json path is not mentioned, in such cases it tries to match the JSON property name by column name and returns its corresponding JSON property value. 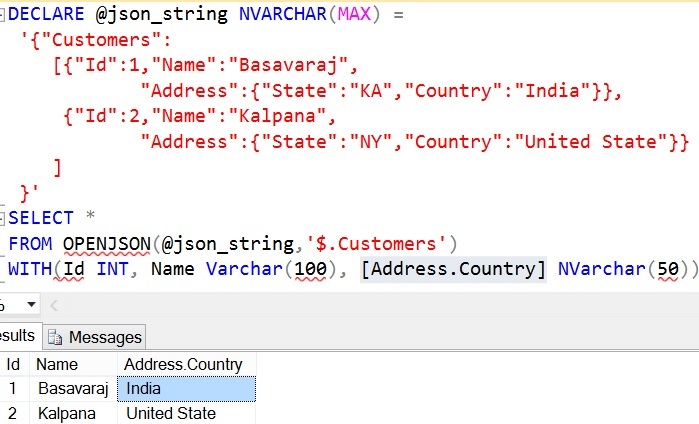 Example 2: Let us extended the example 1, in this example try to get the customer Country from the nested JSON object Address apart from Id and Name. Again in this example the column values json path is not mentioned, so it goes by the column name. 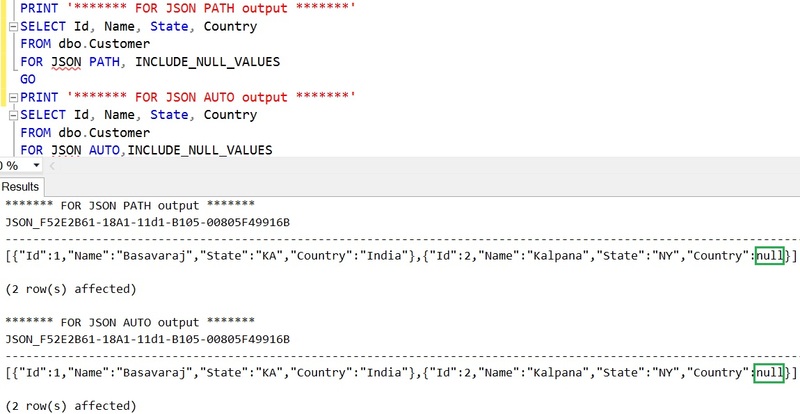 So the column name [Address.Country] implies the OPEJSON function returns the Country property value from the Address JSON object. If column value JSON path is mentioned then it overrides the column name approach to extract the column value. So from the result it is clear that, EmployeeId column value is extracted by the column value json path i.e. ‘$.id’, if it would have gone by the column name then we would have not got any value for this column because there is no property in the input JSON string with key name as EmployeeId. Example 1: In the below example the json_path ‘$.City’ mentioned in the OPENJSON function doesn’t exists in the input JSON string. And in this json_path the JSON path mode has not be specified explicitly, so it goes with default JSON path mode lax. Property cannot be found in specified path. Example 2: In the below OPENJSON function with explicit schema declaration, DOB column value JSON path ‘$.Dob’ doesn’t exists in the input JSON string. In the json_path the JSON path mode has not be specified explicitly, so it goes with default JSON path mode which is lax. 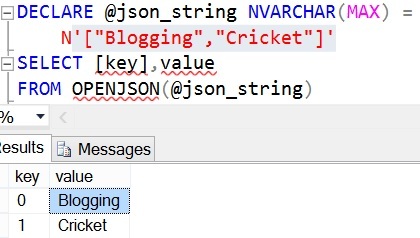 ISJSON function validates whether the string parameter supplied to it is a valid JSON or not. If supplied string is a valid JSON then it will return value as 1, otherwise it returns the value 0. In case input is a NULL then it returns output as NULL. WHERE String_Expression can be a table column or a string (i.e. Varchar/NVarchar) variable or a string constant. And this string expression is evaluated to check whether it is a valid JSON. 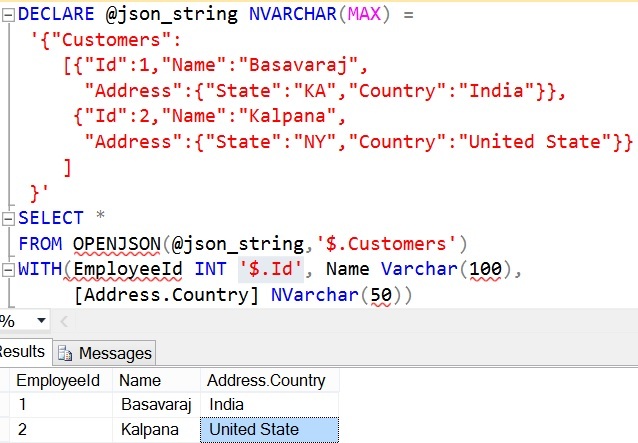 Sql Server 2016 FOR JSON clause can be used to convert the query result to JSON format. It gives flexibility to the developers to convert the result to JSON format in the back-end Sql Server itself, instead of doing it in the client applications. The FOR JSON clause is very much similar to the FOR XML clause. Basically, it converts each row in the result as a JSON object, column names and values are converted as JSON objects name and value pair. 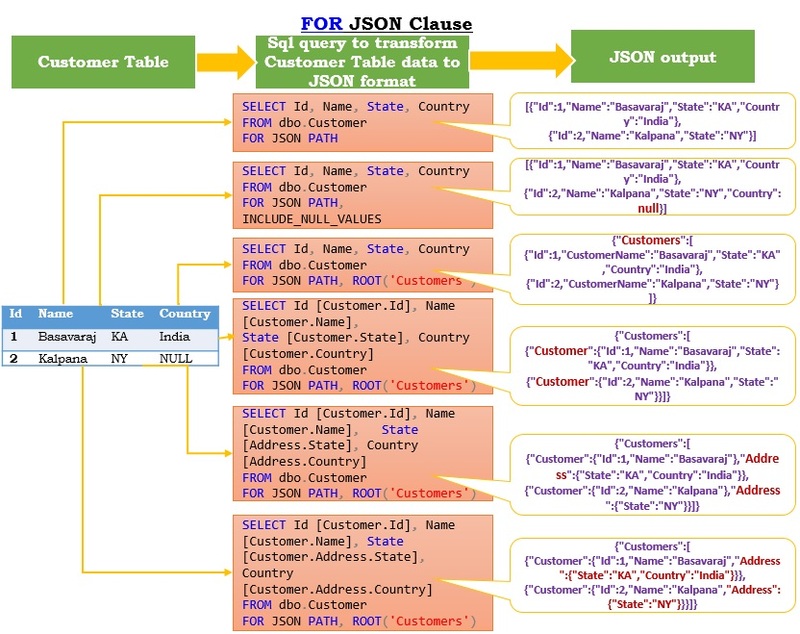 The FOR JSON AUTO clause is very much similar to the FOR XML AUTO clause. It automatically formats the JSON output based on the Column/Tables order in the Select statement. The FOR JSON PATH clause is very much similar to the FOR XML PATH clause. It gives more control over the resulting JSON structure. 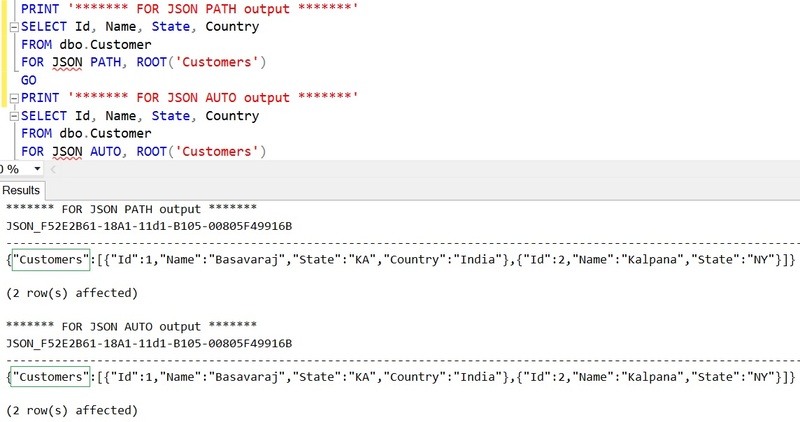 To understand FOR JSON feature, let us create a demo database with Customer table with sample data as shown in the below image by the following script. FOR JSON AUTO requires at least one table for generating JSON objects. Use FOR JSON PATH or add a FROM clause with a table name. From the above result it is clear that the FOR JSON AUTO clause works only if at-least one table is mentioned in the from clause. Example 5: To include NULL values in the JSON output, we need to specify the property INCLUDE_NULL_VALUES in the FOR JSON clause. If this option is not specified, in case of NULL value the name-value pair will be removed from the JSON output. Like country in the previous example for the customer Kalpana. 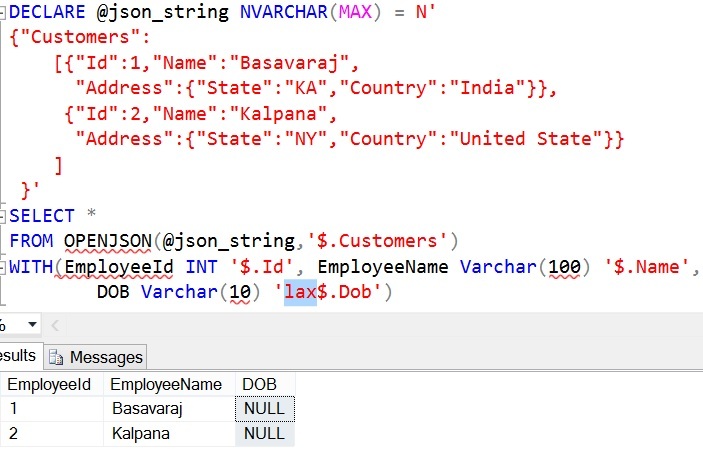 In this article let us understand lax and strict JSON Path modes in Sql Server 2016 in the context of a JSON_VALUE, JSON_QUERY and OPENJSON functions with extensive list of examples. JSON_VALUE is a scalar function that returns the scalar value from the input JSON text from the specified JSON path location. json_string is the JSON string from which the scalar value will be extracted. json_path is the location of the scalar value in the json_string. json_path_mode is optional in the json_path. json_path can be prefixed by the json_path_mode. json_path_mode can be lax or strict. Lax is the default path mode, if json_path is invalid (i.e. it is not present in the json_string) then it returns null, but if path mode is strict it will raise an error. From the result it is clear that JSON_Value function returns a NULL value if it is not able find a value at the specified JSON path. In this case path is trying to find a property City at the root level which is not present so it has returned the value NULL. The default the path mode is lax, because of that we got NULL as a result if the JSON path is not present in the JSON string. From the result it is clear that if JSON path mode is strict then the JSON_VALUE function will return an error instead of returning a NULL value in case if it is not able to find value at the specified JSON path. In the above example the JSON path expression ‘strict$.City’ starts with the word strict, this keyword enforces the JSON path mode as strict. If we don’t specify this keyword by default it is lax. Specifying lax is optional as it is the default JSON path mode. From the result it is clear that lax is the default JSON path mode, if it is specified or not specified and JSON path doesn’t exists in the JSON string then it returns NULL value. Example 4: This is an example of strict JSON path mode where the JSON_VALUE function returning a scalar value as the JSON path is valid. JSON path is not properly formatted. Unexpected character found at position 0. From the result it is clear that we need specify the JSON path modes lax or strict only in lower case.